If you have a sailboat, you need a way to store it safely when it's not in the water or on a trailer. The solution is to use sailboat cradles. While you can buy ready-made cradles, you may want to save money by building your own. You can make cradles for a one-man sailboat in an afternoon. Set two 2-inch by 4-inch boards side by side and nail them together with the nail gun. 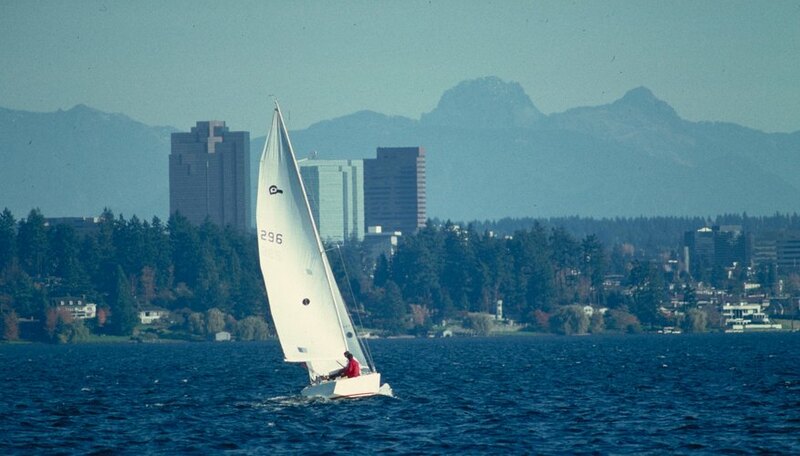 The boards should be as long as your sailboat is wide, probably about 4 feet for a one-man sailboat. Repeat with another set of boards to form the cradle's feet. Set the feet parallel to each other about two and a half feet apart and lay a 2-inch by 4-inch board perpendicularly across the top of the feet at each end. Nail the boards so they securely brace the feet. You should end up with a rectangular base structure. Cut four more 2-inch by 4-inch boards to 2 1/2 feet long. Lay the first board across the tops of the feet, about six inches toward a cradle edge from the center, and nail it down. Lay a second board across the feet, about six inches from the center toward the other edge, and nail it. Nail another board on top of the first, and nail the last board on top of the second to finish the cradle supports. Cut two 2-inch by 6-inch boards to 2 1/2 feet long. Lay the boards across the middle of the cradle feet, resting an edge of each board near the center and resting the other edges against the tops of the cradle supports to form a V-shaped pocket for the boat. Nail the 2-inch by 6-inch boards in place with the nail gun. Cut a carpet remnant large enough to cover the V-shaped pocket. Nail the corners to hold the carpet in place. Make as many cradles as you need to fully support your sailboat. Raise or lower the angle of the V-shaped pocket by adding or subtracting boards to the cradle supports. Larger boats may need more support, which can be added as needed by nailing 2-inch by 4-inch boards vertically to the cradle feet and adding a small piece of carpet to the top of each brace. Tad Cronn is a professional journalist living in Los Angeles. His columns have appeared in the "Los Angeles Daily News," the "Seattle Post-Intelligencer," the "Orange County Register" and other publications. He is an award-winning illustrator, author of "The Lynx," and an experienced handyman, model builder and gamer.